Today the descendants of Gustave Sennelier still create their extraordinarily luscious colors from the finest hand-ground pigments combined with pure, first-press non-yellowing safflower oils. 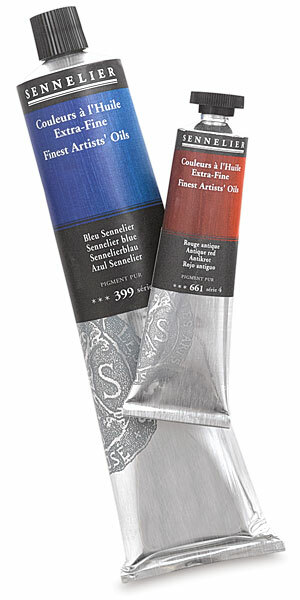 They produce an outstanding collection of oils distinguished by a "satin" finish and buttery feel. The paints still entrance artists, just as they did when pioneers such as Paul Cézanne and Camille Pissarro first used them. Many colors are exclusive to Sennelier, including Chinese Orange, Sennelier Transparent Brown, a range of semi-opaque Mars colors, transparent Alizarins, and the unusual Cinnabar and Cobalt Greens. Their Titanium White is considered to be the most opaque Titanium White ever made. 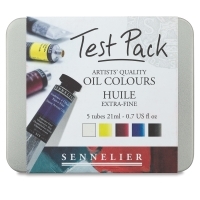 Every one of these colors is remarkably rich, vivid, and responsive, as only a Sennelier oil can be. 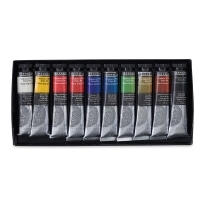 Set of 10 — This set includes Bright Yellow, Burnt Sienna, Chromium Green Light, French Vermilion, Ivory Black, Permanent Intense Red, Phthalo Blue, Titanium White, Ultramarine Deep, and Yellow Ochre in 21 ml (0.7 oz) tubes. 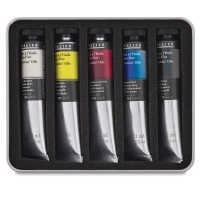 Oil Test Pack, Set of 5 — This superbly balanced selection of five colors includes Alizarin Crimson, Ivory Black, Lemon Yellow, Titanium White, and Ultramarine Deep in 21 ml (0.7 oz) tubes. The tin measures 1-1/2" x 5-1/2" x 4-1/2". The descendants of Gustave Sennelier still create their extraordinarily luscious colors from the finest hand-ground pigments combined with pure, first-press non-yellowing safflower oils. They produce an outstanding collection of oils distinguished by a "satin" finish and creamy texture. The paints still entrance artists, just as they did when pioneers such as Paul Cézanne and Camille Pissaro first used them.